Creative Inkspirations: Twice in One Week! Can you believe it? Two post in one week, I know amazing lol! Well, I have had some stamping time this week, hoping for more too! I got new rubber this week and could hardly wait to use it! This card features 2 of my new sets, Hieroglyph Horses and Just Because. It also features the use of a new tool we are carrying, called the Scor-Pal the card is called a Layered Fold. Once you get the measurements down it is pretty easy and looks pretty cool! I think this one just needs a little something extra, but I like it none the less! Great card! I really want to get one of those Scor-pals. They can do some awesome things!! Love this fold! Do you have instructions for it???? Aren't those papers the best of the best for male stuff? 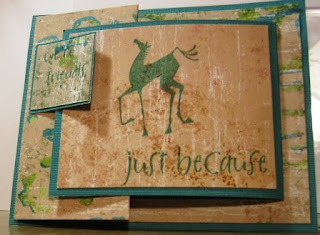 AND the just because set is one of the stamp sets I use all the time. I just love it!